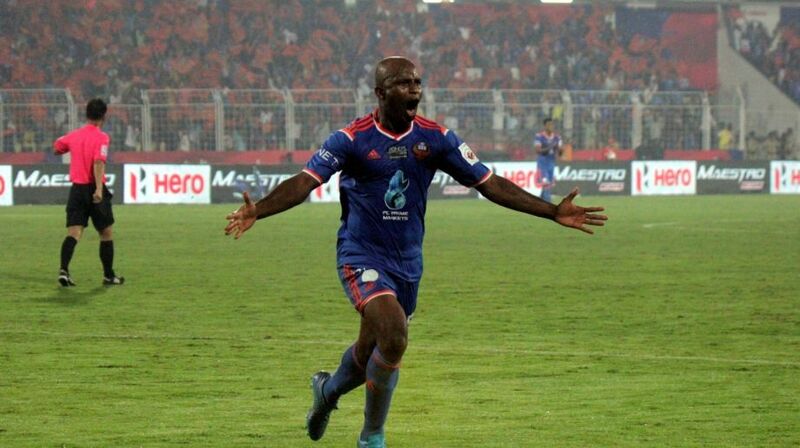 Nigerian striker Dudu Omagbemi scored a brace either side of Shillong Lajong’s two goals to just about keep their title hopes alive with a 2-2 draw in a crucial I-League encounter here at the Jawaharlal Nehru Stadium on Monday. Dudu gave East Bengal the lead in the 20th minute before a second half stirring performance by the home team saw Aibanbha Kupar Dohling (49th) and Samuel Lalmuanpuia (69th, penalty) score twice to push the visitors on the brink. In the 88th minute, Dudu, who scored four goals against Chennai City FC in their last game, pulled one back for East Bengal to take them to 30 points, same as third-placed Mohun Bagan with one game in hand. Second-placed Neroca FC (31 points) take on East Bengal in Kolkata on March 8. Minerva Punjab FC (32 points) are top of the table and play Churchill Brothers in their last outing on the same day. On March 8, Mohun Bagan will take on Gokulam Kerala FC away in what promises to be a grandstand finish to the league. Coming to the game, East Bengal got the first chance of the game when Brandon Vanlalremdika set up Dudu into the space between the defenders and the goalkeeper but the Nigerian veteran striker could not meet the aerial ball as home keeper Nidhin Lal punched the ball away. One minute later, Ansumana Kromah shot over the bar after doing well to get inside the 18-yard box. The visitors got the lead minutes later. The impressive Lalram Chullova put in a beautiful through ball inside the area for Dudu, who timed his run to perfection, to sneak in a header. Kromah came close twice in quick succession, first shooting over and then forcing a good save from Nidhin Lal. Lajong got two good opportunities towards the end of the first half. First, Redeem Tlang drove at the rival defence before playing a one-two with Samuel on the edge of the box. Tlang then got inside the box but sliced his attempt wide of goal from close. Samuel then tried his luck from range from a counter attack but the ball agonisingly kissed the bar and went out for a goalkick. In the second half, Lajong came roaring back into the game with two goals. Dohling first turned in the brilliant Samuel’s free kick, beating Gurwinder Singh in the air to equalise. Then Samuel was brought down by Mehtab Singh inside the box and the former stepped up for the spot kick to make it 2-1. East Bengal paid the price for taking their foot off the pedal and just when it looked like they would succumb to a shock defeat, Dudu made it 2-2, nodding in Kromah’s fizzing cross.